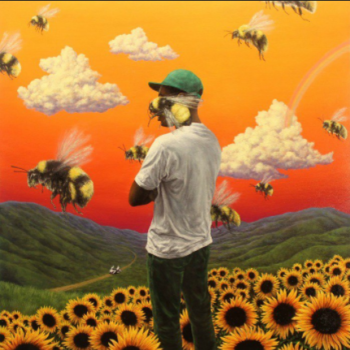 Officially known as Scum F**k Flower Boy (hereafter SFFB), the latest album by Tyler, the Creator is making waves on charts everywhere. It was named “Best New Music” hours after its release on July 21, and the single “Who Dat Boy” ft. A$AP Rocky was the #1 streamed song on Spotify that day, as well. I have to admit that after Tyler’s last album, Cherry Bomb, I had very low expectations for SFFB. Now don’t get me wrong… I didn’t hate Cherry Bomb. I really loved a few of the songs, such as the jazzy “FIND YOUR WINGS.” However, given how I normally respond to Tyler’s work, I was incredibly underwhelmed. There’s been talk about the lyrics of tracks like “Garden Shed” being an admission of Tyler’s homosexuality. If that’s the case, more power to him; love is love. Although as a long time listener, I get the feeling that the lyrics could literally just be in place to spark interest and conversation. In “I Ain’t Got Time,” he says that he’s “…been kissing white boys since 2004.” Who really knows besides Tyler? If you haven’t already, Tyler fan or not, give this album a go. If you like mellower rap, this is the direction to go in. There are quite a few soft vocals and piano samples sprinkled throughout, which definitely adds to my list of reasons why I enjoy it so much.